Ariel Dorfman's play Death and the Maiden borrows its title from a string quartet composed by Franz Schubert. In the play, Paulina Salas recalls that her torturer played the Schubert piece as the soundtrack to her ordeal. Here, thanks to research by our friends at the Australian Chamber Orchestra, we delve into the history of Schubert's music, the life of the composer and include a playlist of one of the composition's seminal recordings. Franz Schubert first composed 'Death and the Maiden' as a song in 1817, inspired by a poem of the same name by Matthias Claudius. The poem draws on both the 19th-century fascination with Gothic horror stories and a desire to find an acceptance of mortality. In a strongly Christian culture, death could be perceived as either a scourge or a blessing, the distinction was not always clear. "I find myself to be the most unhappy and wretched creature in the world. Imagine a man whose health will never be right again, and who in sheer despair continually makes things worse and worse instead of better; imagine a man, I say, whose most brilliant hopes have perished, to whom the felicity of love and friendship have nothing to offer but pain at best, whom enthusiasm (at least of the stimulating variety) for all things beautiful threatens to forsake, and I ask you, is he not a miserable, unhappy being? ‘My peace is gone, my heart is sore, I shall find it nevermore,’ I might as well sing every day now, for upon retiring to bed each night I hope that I may not wake again, and each morning only recalls yesterday’s grief." Schubert was born, bred, lived, and died in Vienna. As an infant he took piano lessons from his brother Ignaz, but young Franz quickly outstripped his elder brother and proceeded to instruct himself. 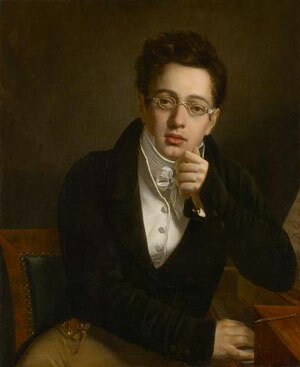 When Schubert was seven, he was engaged to sing at the Imperial Chapel, and at the age of eight he took up the violin and organ, and began elementary lessons in the techniques of composition. Schubert’s earliest surviving music dates from when he was a young teenager, but it is clear that he had been composing for as long as he had known what music was (from the outset he was transfixed by the music of Haydn and Mozart). "Schubert’s outward appearance was anything but striking or prepossessing. He was short of stature, with a full, round face, and was rather stout. His forehead was very beautifully domed. Because of his short-sightedness he always wore spectacles, which he did not take off even during sleep. Dress was a thing in which he took no interest whatsoever." By 1820, Schubert had written music of the highest quality for church and stage, as well as symphonies (six of them, in fact), chamber music, and hundreds of songs. Schubert remains one of the most intriguing characters in the history of composition; his was a life which often seemed dedicated to having a good time with his friends whenever possible, but still he worked very hard, turning out symphonies, chamber music, piano music, ten resoundingly unsuccessful operas and 600 of the best songs ever written. Standing 152cm tall, balding, bespectacled and with the unprepossessing nicknames ‘Mushroom’ or ‘Fatso’, he yet had a passionate soul and was unafraid to reveal it in his music. He even has his own type of party named after him. Sadly, the rollicking young man of the Schubertiad parties was rarely to be seen in 1828. The Bohemian life had caught up with him, and although he declared himself ‘perfectly well’ his friends wrote to one another of their mild concerns for his health. He had previously contracted syphilis. Painful and embarrassing in itself, its wider ramifications were staring the young composer in the face in 1828 as he watched most of his circle of friends settle into marriage and domesticity. Perhaps searching for a different kind of stability, one where infection wouldn’t be a consideration, Schubert seemed to be thinking about becoming a Kapellmeister or senior church musician. Once a good choirboy himself (a member of what later became the Vienna Boys’ Choir), he had already written a couple of Masses and numerous smaller religious works when in October 1828 he booked himself into a course in counterpoint with the then-court organist, Simon Sechter. Sechter later taught Bruckner and Liszt too – but Schubert was only to have one lesson before his health declined. Within the space of a fortnight he was dead, aged 31. Listen in to legendary recordings of Schubert's original 1817 'Death and the Maiden' as well as the later string quartet, which is featured in Ariel Drofman's play. * A free Spotify account is required to stream this playlist (simply follow the prompts to sign up).